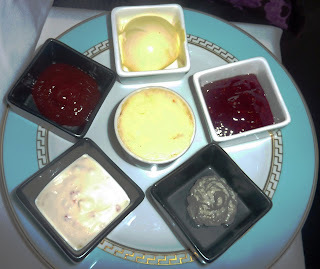 London spoils the afternoon tea lover with so many options that it is hard to know where to start. On a short trip it is even more difficult – should we go traditional and search out the best scones and finger sandwiches at a posh old-school hotel? Or something more cutting edge? At the Mandeville Hotel, amid the stylish shopping hub of Marylebone, we found all the traditions that we love about afternoon tea, with some delightful twists. The Hotel itself is definitely in the luxe category, and I could quite happily set up home there. Alas we merely partook of the afternoon tea, served in the deVille Restaurant which is an elegant blend of cosy banquettes and plush fabrics set off by funky art and lots of flowers – the perfect tea-time setting. Depending on your mood you can choose from a range of menus – both for food and tea. If you are feeling girly – the Fashion Ladies Afternoon Tea is served on fine pink china with a selection of scones, pink meringues and sandwiches. Purporting to be a more masculine affair – the Men’s Afternoon Tea is no less dainty, but served – naturally – on blue china, with the option of fine whiskies as an accompaniment to the very tempting treats on offer from the kitchen. We chose this more interesting sounding menu – and it turned out to be an indulgent, modern take on the traditional afternoon tea. Highlights on the savoury side included roasted sirloin with red onion thyme jam on a mini foccacia, beef and chicken satay with chilli créme-fraiche, and potted shrimps with gentlemen’s relish and toast. 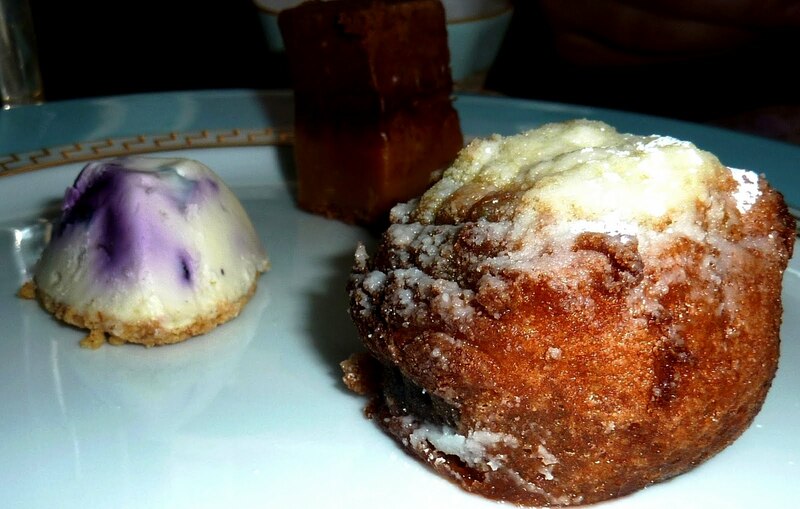 The sweets were equally thoughtful and tasty creations, including – a double chocolate brownie, lemon-basil tart, chocolate-blueberry cheese cake, fig chocolate beignet, and freshly baked raisin scones with Devonshire clotted cream and strawberry jam. 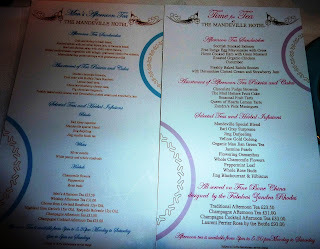 Quibbles with gender specificity cast neatly to one side, the Men’s menu was certainly working a charm for most of the couples we spotted around the room, though a few pink meringues were also doing the rounds. The selection of tea for both menus is first class, and can be served with champagne if you wish, but for me, a perfectly brewed White Peony with Whole Rosebuds blend was the ultimate counter to the rich spread. My cup was also rarely half full thanks to the delightful, warm service of our waitress who returned with our individual pots for refreshers regularly and looked after us exceptionally well. 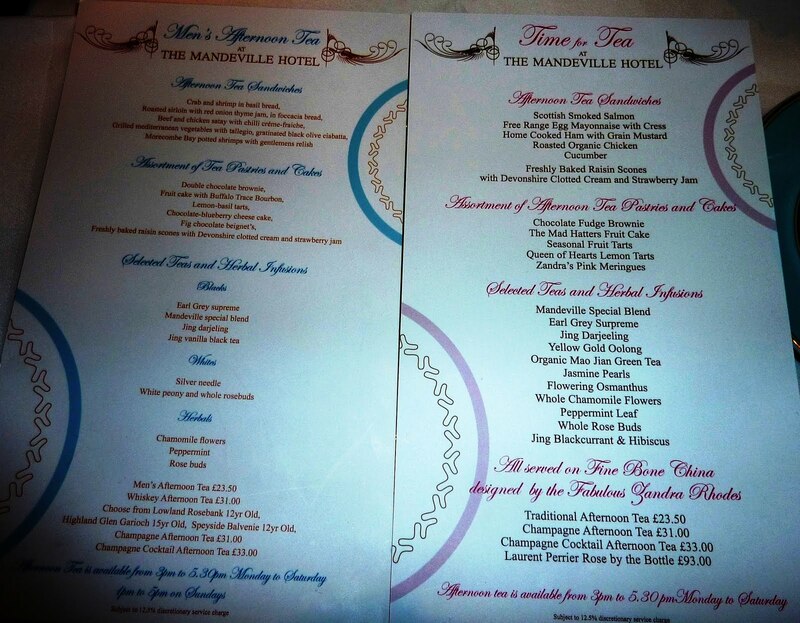 Starting at 26.50 GBP, afternoon tea at the Mandeville is good value for such a quality experience. 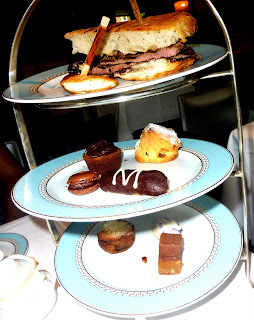 London has so many wonderful places for afternoon tea – but if you are looking for something a little different and a little special, the Mandeville is definitely worth a twirl.